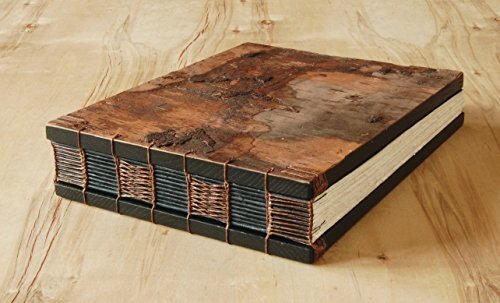 The covers of this sturdy wood book have been distressed in layers of black. The front cover is decorated with a layer of tree bark. It measures approximately 9 inches wide by 7 inches tall. It has 160 hand torn pages (counting the front & back of each sheet) of medium weight acid free drawing paper perfect for writing or sketching or holding your memories. It would also make an interesting conversation piece displayed on a table or shelf. The binding, complete with headbands is sewn in sturdy walnut brown linen thread. This book will lay flat when open. Personalize this book for your wedding or the perfect gift. You can add a hand stamped metal nameplate to this (or any other book in my shop). The name plates are available in brass, copper and silver. Please select your preference from the drop down menu at checkout. This book is in stock & ready to ship. All books ship Priority Mail within 1-2 of purchase. Giving this as a gift? All books come gift wrapped. I am happy to include a card with your personal message. Please feel free to contact me with any questions. Thanks for looking! View More In Books & Journals. If you have any questions about this product by Three Trees Bindery, contact us by completing and submitting the form below. If you are looking for a specif part number, please include it with your message.